Alec Martinez (LA - 27) celebrates his game winning goal in overtime. Alec Martinez (LA - 27, not pictured) scores the game winning goal in OT against Curtis McElhinney (CBJ - 30). 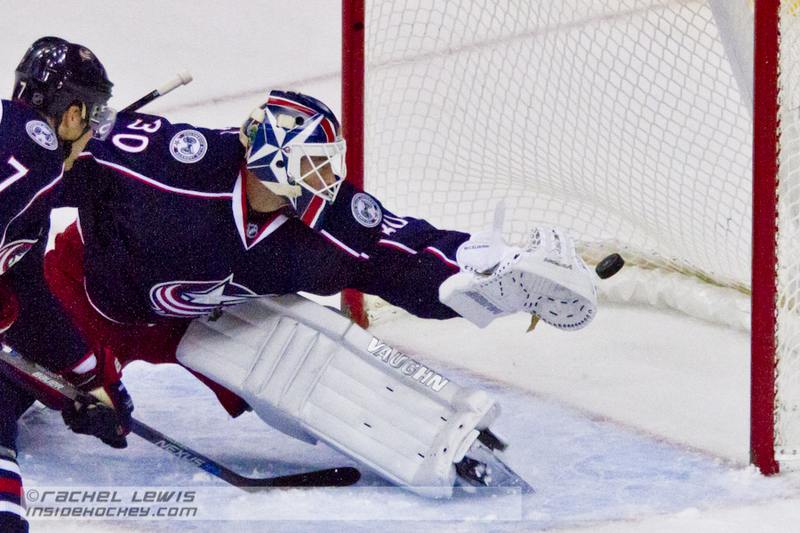 McElhinney replaced an injured Sergei Bobrovsky late in the third period. Jonathan Quick (LA - 32) gets a face full of snow courtesy of Brandon Dubinsky (CBJ - 17). Jonathan Quick (LA - 32) makes a save against Ryan Johansen (CBJ - 19). Michael Chaput (CBJ - 39) is open for the puck. 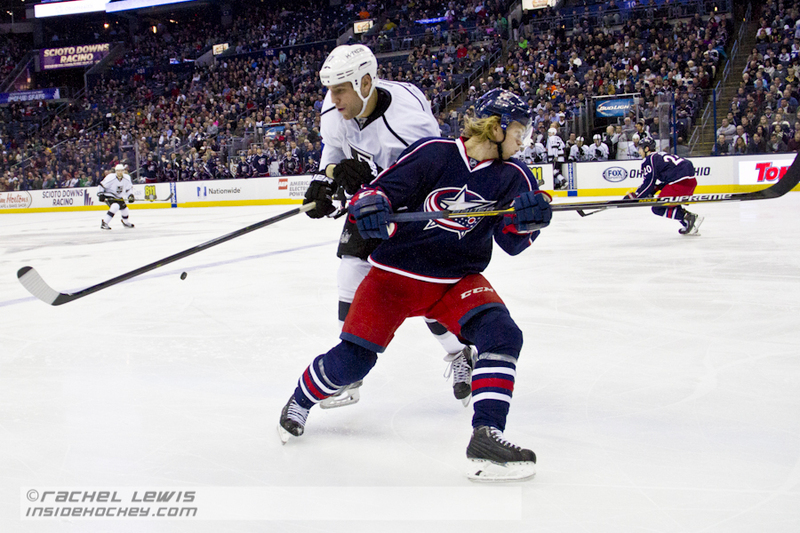 Brandon Dubinsky (CBJ - 17) has words with Dustin Brown (LA - 23) during a stoppage in play. Brandon Dubinsky (CBJ - 17) faces off against Nick Shore (LA - 21). Drew Doughty (LA - 8) takes a shot on net. 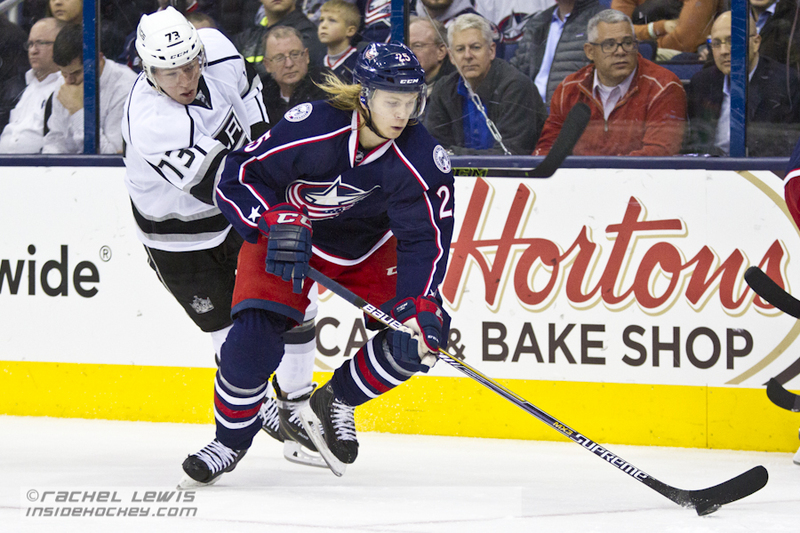 William Karlsson (CBJ - 25) skates the puck away from Tyler Toffoli (LA - 73). Alec Martinez (LA - 27) is named the second star of the game. Sergei Bobrovsky (CBJ - 72) makes a save against Tyler Toffoli (LA - 73). Milan Lucic (LA - 17) keeps William Karlsson (CBJ - 25) from the puck. Ryan Murray (CBJ - 27) shoots the puck out of the Columbus zone. Jack Johnson (CBJ - 7) slams Tyler Toffoli (LA - 73) to the ice. Jordan Nolan (LA - 71) checks Alexander Wennberg (CBJ - 41) into the boards. Sergei Bobrovsky (CBJ - 72) makes a glove save. 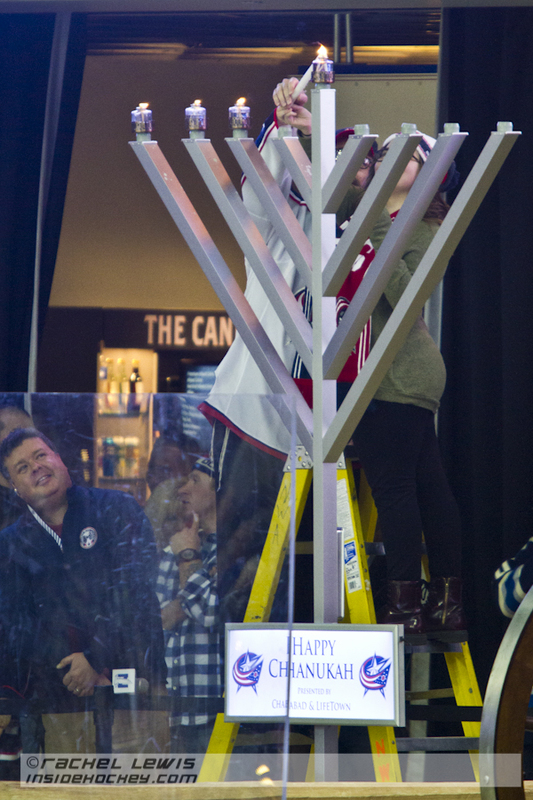 A local rabbi lights the menorah for the third night of Hanukkah at the Blue Jackets game. 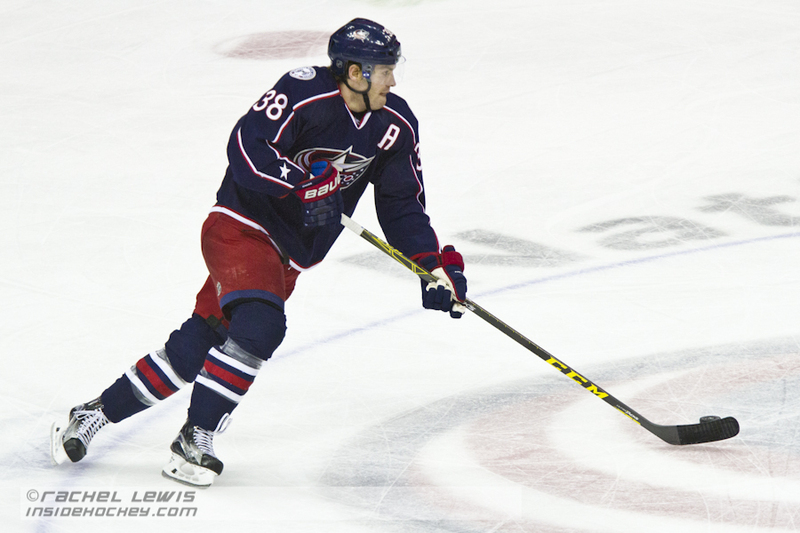 Boone Jenner (CBJ - 38) skates the puck through the neutral zone. Brandon Dubinsky (CBJ - 17) nails Alec Martinez (LA - 27) to the boards. Jonathan Quick (LA - 32) durings warmups. Drew Doughty (LA - 8) celebrates his birthday with a win in Columbus. Jhonas Enroth (LA - 1) during warmups. 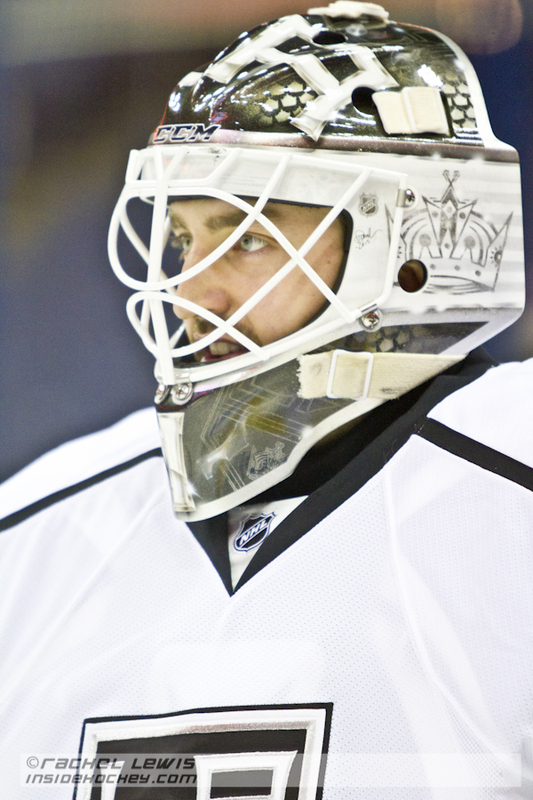 Jhonas Enroth (LA – 1) during warmups. 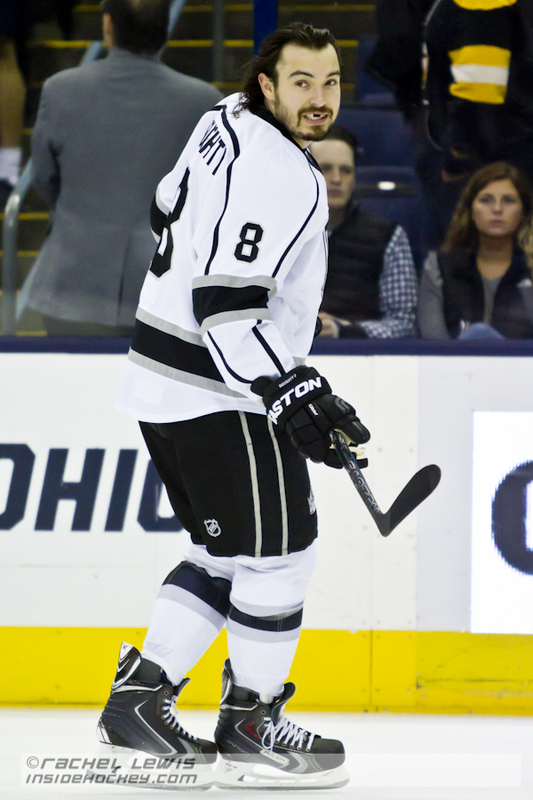 Drew Doughty (LA – 8) celebrates his birthday with a win in Columbus. 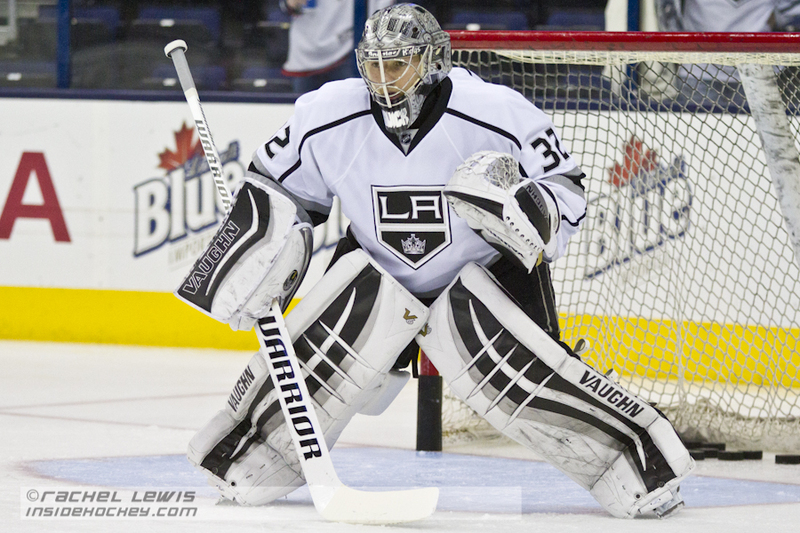 Jonathan Quick (LA – 32) durings warmups. Brandon Dubinsky (CBJ – 17) nails Alec Martinez (LA – 27) to the boards. Boone Jenner (CBJ – 38) skates the puck through the neutral zone. 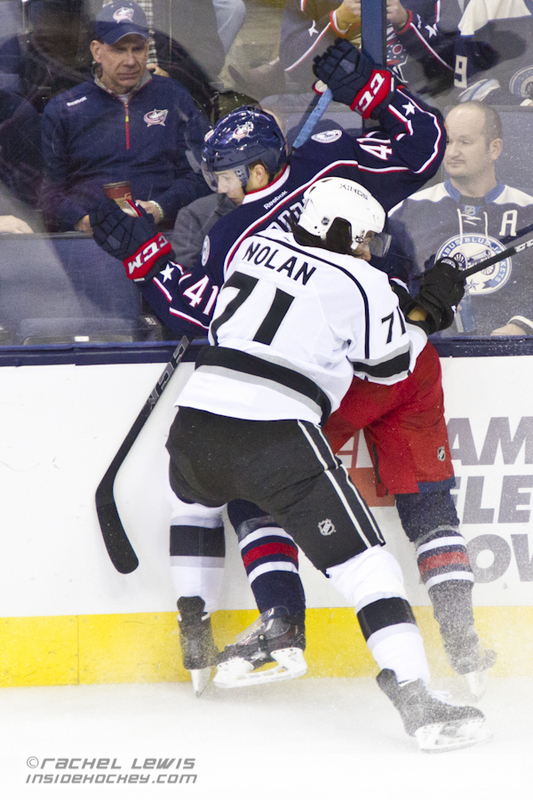 Jordan Nolan (LA – 71) checks Alexander Wennberg (CBJ – 41) into the boards. Jack Johnson (CBJ – 7) slams Tyler Toffoli (LA – 73) to the ice. Ryan Murray (CBJ – 27) shoots the puck out of the Columbus zone. Milan Lucic (LA – 17) keeps William Karlsson (CBJ – 25) from the puck. Sergei Bobrovsky (CBJ – 72) makes a save against Tyler Toffoli (LA – 73). 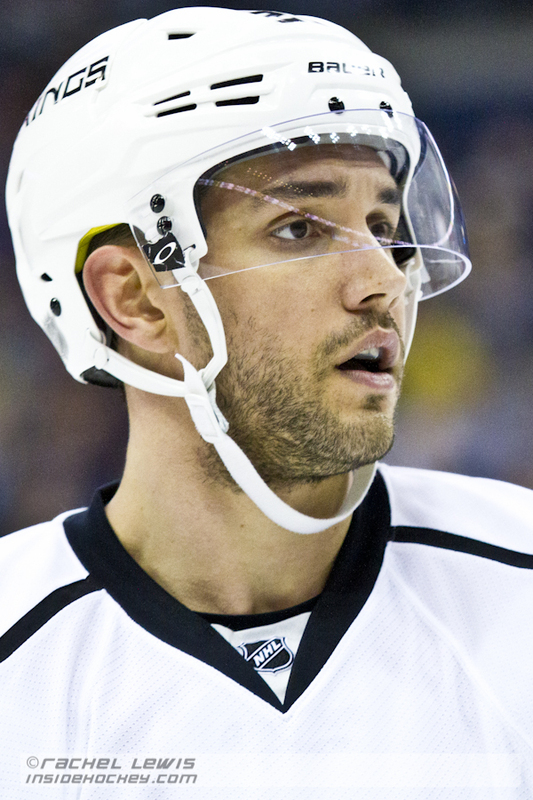 Alec Martinez (LA – 27) is named the second star of the game. William Karlsson (CBJ – 25) skates the puck away from Tyler Toffoli (LA – 73). 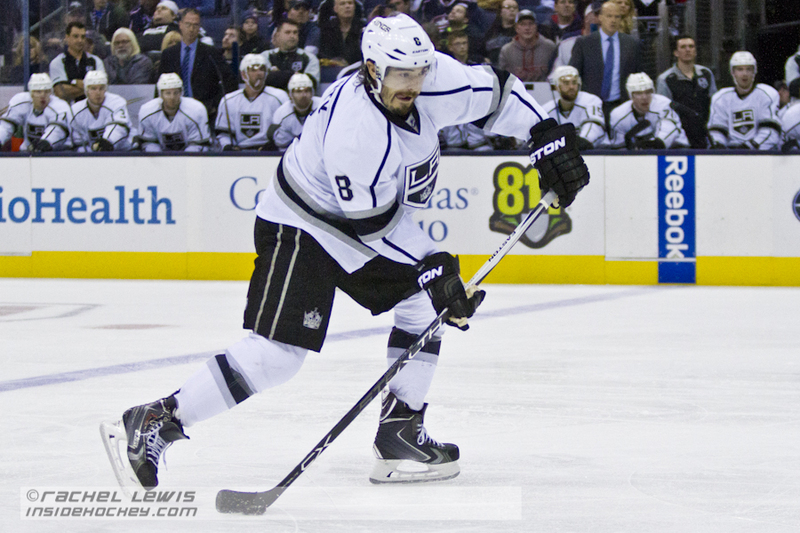 Drew Doughty (LA – 8) takes a shot on net. Brandon Dubinsky (CBJ – 17) faces off against Nick Shore (LA – 21). 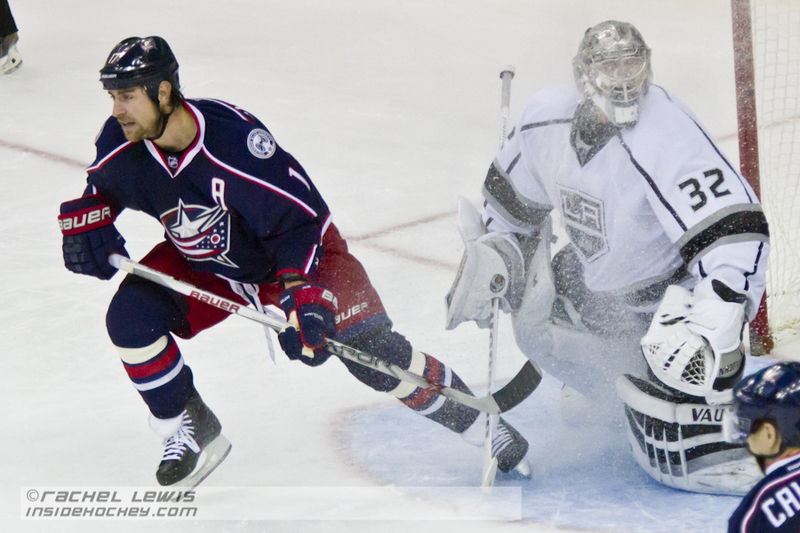 Brandon Dubinsky (CBJ – 17) has words with Dustin Brown (LA – 23) during a stoppage in play. 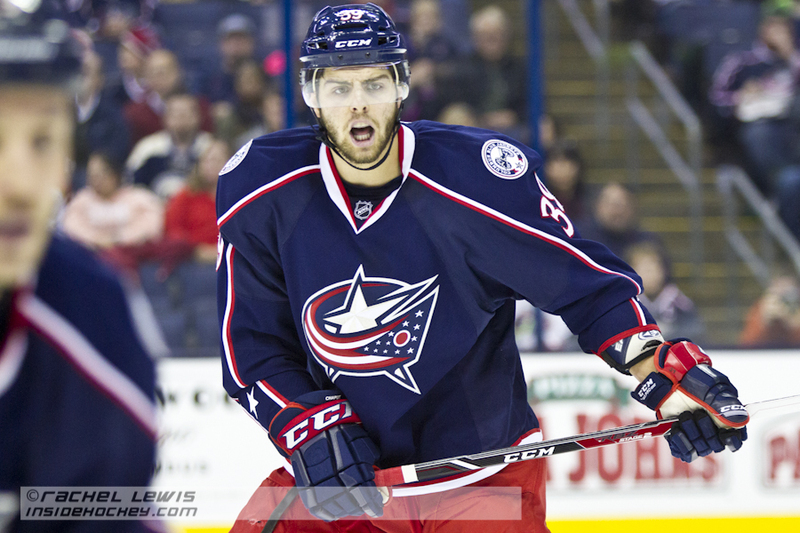 Michael Chaput (CBJ – 39) is open for the puck. Jonathan Quick (LA – 32) makes a save against Ryan Johansen (CBJ – 19). Jonathan Quick (LA – 32) gets a face full of snow courtesy of Brandon Dubinsky (CBJ – 17). 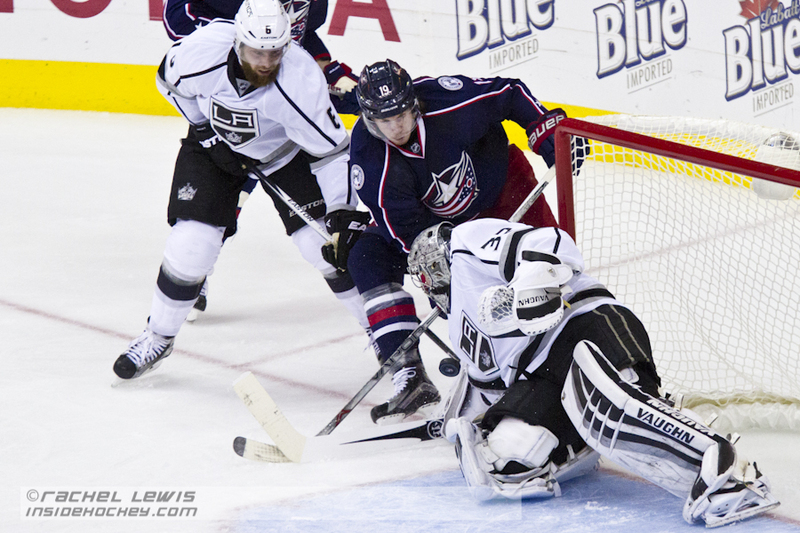 Alec Martinez (LA – 27, not pictured) scores the game winning goal in OT against Curtis McElhinney (CBJ – 30). 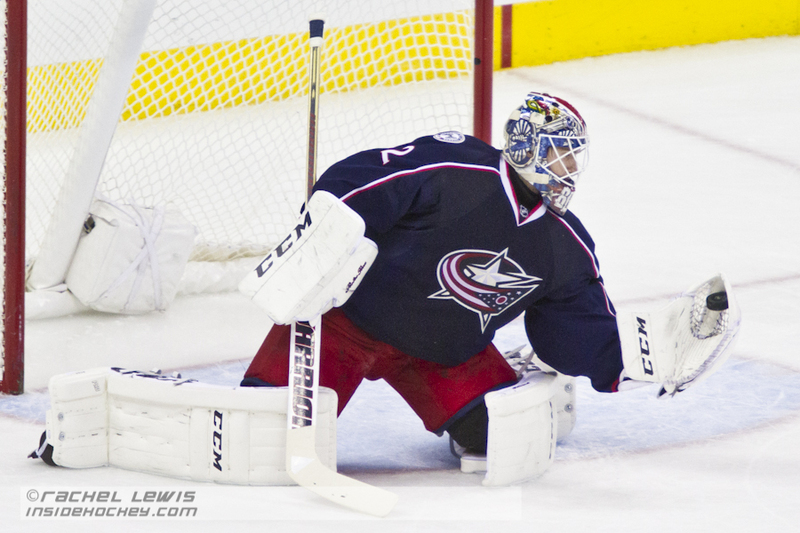 McElhinney replaced an injured Sergei Bobrovsky late in the third period. 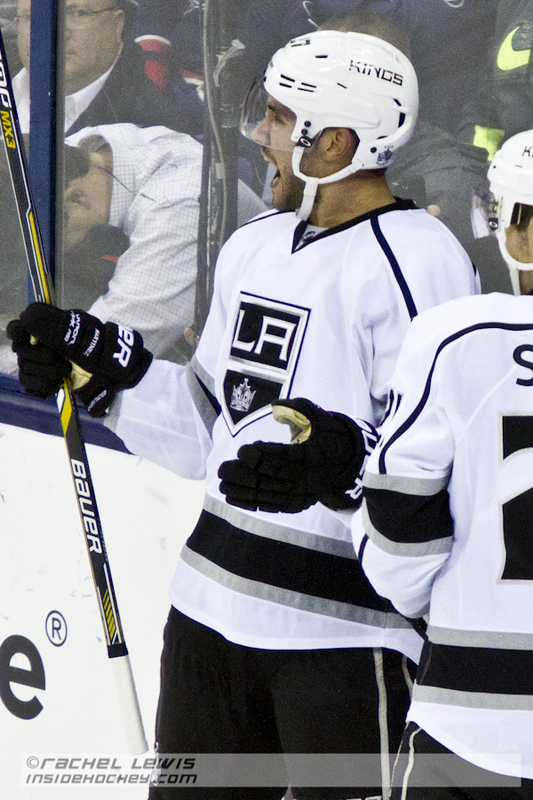 Alec Martinez (LA – 27) celebrates his game winning goal in overtime.